I have very fond memories of breakfast pastries. Growing up, every once in a while as a treat, my dad would drive to the local bakery and come home with AMAZING freshly-made pastries and danishes for our breakfast. My personal favorite was a round-shaped one with raspberry, cherry or cream cheese filling in the center, drizzled with a super sweet, super delicious glaze. Mmmmm. I found myself thinking about those wonderful childhood pastries recently, so, one quiet weekend, I decided to try my hand at making homemade breakfast pastries for my family. To make cream cheese danish: (Beat the following 4 ingredients together until smooth). In medium bowl, combine yeast, 1 tsp sugar and warm water; let stand until foamy & frothy, about 5 minutes. Meanwhile, in large bowl, whisk together flour, 1/3 cup sugar and salt; cut in butter with pastry blender or two knives used in a scissor-like fashion until mixture resembles cornmeal. Whisk 3 eggs and 1/2 cup cream into (now frothy) yeast mixture; pour into flour mixture and stir to incorporate, until moistened. Cover bowl with plastic wrap and refrigerate for at least 8 hours, or overnight. Preheat oven to 350 degrees F; butter two large baking sheets; set wire racks over waxed paper. Remove dough from refrigerator, divide dough in two (return one half of dough to the fridge), and use a rolling pin to roll out one half of the dough into a 12-inch square on a lightly floured board; cut into nine 4-inch squares. Dollop 1 tbsp of the filling into the center of each square of rolled dough. On each square, slice a 2-inch cut from each corner in toward the center; fold every other tip in toward the center (pressing firmly), forming the pinwheel shape (easy peasy!) Transfer pinwheels to baking sheets using a spatula. Repeat with remaining dough and filling. Beat 1 egg with 1 Tbsp water in a small cup; brush this egg wash lightly over pastries using a pastry brush. Bake in preheated (350 degree F) oven for about 25 minutes — switching baking sheets on oven racks halfway through baking time — until beautifully golden. Transfer pastries to prepared wire racks to cool completely. Meanwhile, to prepare the icing glaze: in a small bowl, mix powdered sugar with 2 tbsp cream. Once pastries are completely cool, using a fork or spoon, drizzle icing glaze over pastries in zig-zag pattern. Oh wow!! These are freaking gorgeous. Love! These are so pretty! 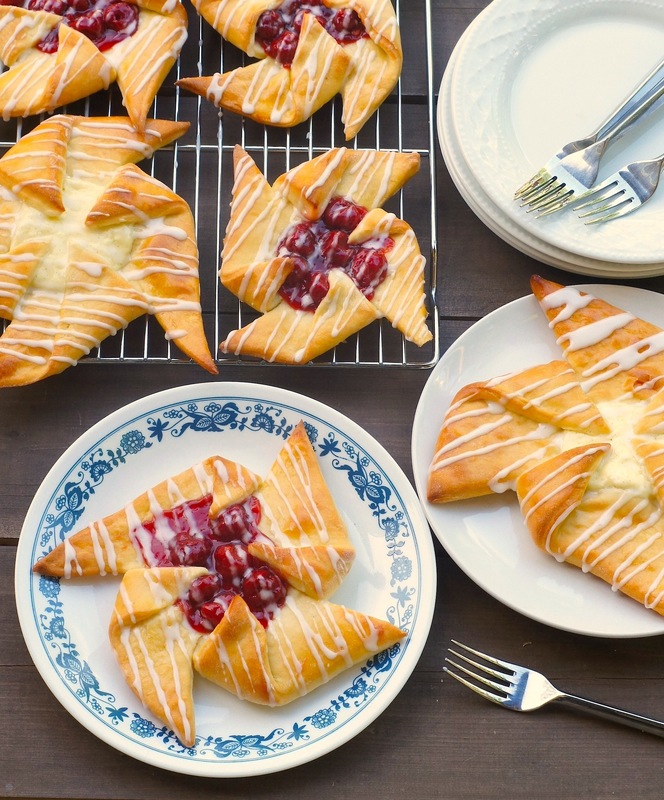 I love breakfast pastries, but have to admit I’ve never tried to make my own Danish pastries! Seeing yours really makes me want to though! Thank you, Annie! They were SO enjoyable to make. Definitely took a little time, but I actually find that relaxing – the different steps, the dough resting time, etc. Hope you try them and love them! I’m not comprehending when you write “make them a more reasonable size” because those big pastries look the perfect size to me! What a great breakfast treat! Bahaha, Leah, you are so funny! These are so pretty! I love that you gave options for cherry or cream cheese filling too! So adorable! Im really impressed. Im going to my home town this week and i have a favorite pastry that my dad would always bring home for me, which i plan on getting! Breakfast pastries are one of my weaknesses! I just can’t pass a good one up, and yours look gorgeous and so yummy! These are gorgeous. My husband and my dad are obsessed with danish. My dad’s fav is cherry and my hubby likes the cheese. This post was made for them. Pinned and pinned! These danish look gorgeous! Love your fun shape. Whenever I buy pastries, I always go for the danish first. Pinning this! What a gorgeous presentation to boot! I’ll be pinning as well! oh yuuummmmmm these look absolutely delish! Oh heavens, these look beautiful and so fun. i just got back from a business trip where we ate way too many of these in meetings…will totally be having withdrawal so now i’ll have to make my own! i can’t wait! They are absolutely gorgeous. I am planning my besties baby shower, reckon these beauties will be on the menu. So pretty, and who doesnt love danish right?! these are just the cutest pinwheels i have ever seen! love the innovative take on the classic danish recipe… yum! Beautiful! What immaculate work. I adore cheese danish! WOW! Don’t these look so beautiful!! Lovely recipe They look like the packaged ones you buy… but these are so much fresher and better for you! LOVE it !!! Pastries in the morning are the best way to make sure you have a good day, and another one at night makes sure your day ends well too. That’s my philosophy! These are so beautiful! I love that you made your own dough…definitely pinning because I have never attempted! These look beautiful Amy! I love that you made your own dough and I think they look like the perfect size to me They definitely look better than any one bought from the bakery and the two fillings sound perfect! These danishes look amazing! Your pictures are stunning! I make lemon curd danishes for the first time earlier this year, I was surprised how easy to make they were! Definitely bookmarking this recipe to try- looks fab! I love lemon anything, so I know I’d love your lemon curd danishes. YUM! How cute these danishes are! That pinwheel shape is awesome! I gotta whip up some of these soon! Pinning! Those really do look beautiful. Maybe a bit large, but probably equally wonderful when cut in half! These look so pretty and really perfectly shaped. I love a good breakfast pastry – it’s such a nice treat! these are so pretty, amy! good job! Never been overly into Danishs, but you’ve made them rather enticing to this glutton.